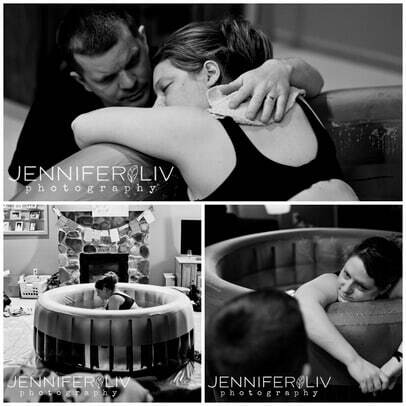 Hypnobabies instructor Erica Gunderson shares her Home Birth After Cesarean (HBAC) birthing story on the Twin Cities Hypnobabies website and we’re sharing with you! You are just over two months old now and the absolute light of my life! We have spent the last two months cuddling, nursing, and getting to know and love each other more and more each day. I could not imagine a more perfect little girl to join our family – your Brothers, Daddy, and I are so blessed. I decided as soon as I found out that we were expecting a baby, that I wanted to have you at home. I longed to be able to hold my baby immediately after birth and get all of the uninterrupted skin-to-skin cuddle time that I could handle – something I never had with your brothers. I wanted you wet, slimy, perfectly new, and placed in my arms for your Dad and I to awe over for as long as we wanted. I couldn’t wait for this experience! The weeks leading up to your birth were filled with anticipation, and I’ll admit it, a good deal of effort to get you to arrive sooner rather than later. I ate lots of fresh pineapple and spicy thai food, had lots of “alone time” with Dad, chiropractic adjustments, we walked, and listened to the Hypnobabies “Come out Baby” track. Forty weeks had come and gone, and without very many signs from my body (other than a lot of braxton hicks waves) I thought it might be a bit before you would come earthside. During my 40 week prenatal appointment, our midwife Kate had mentioned acupuncture as a gentle way to encourage waves if I was wanting something to start. She was completely fine with letting you come whenever you were ready, and didn’t think acupuncture was necessary, but that it also wouldn’t hurt anything. I decided to give it a go! I received my first treatment on Thursday at 40 weeks and 2 days. I was told many moms go into their birthing time a day or two later if they are favorable, so I was crossing my fingers this would be the case for me! Read the rest of this beautiful story HERE.